Have an Idea to Start a Business? Turn your ideas into action and fast track your success at the Startup Business Boot Camp, a concentrated, intensive hands-on event where you start with an idea on Friday evening and by Sunday afternoon you can literally be in business ready to generate your first lead or customer. Invest in the one thing you have control over...YOURSELF! Check our event schedules for the next FREE SEMINAR or Boot Camp Weekend events in your city. "How to Turn an Idea Into a Business in 24 Hours"
Learn the latest tips, techniques, and tools to launch your business in today's economy! The perfect option if you cannot make a live workshop! You'll get access to the full workshop plus numerous bonuses and more deep-dives into the content of how to turn your ideas into revenue quickly and inexpensively. What normally would take weeks or even months and lots of money can be done with our powerful process in a weekend for a fraction of the cost. Don’t guess your way to success. And don’t get caught in the trap of “perpetual preparation”, it has never been easier, cheaper and more necessary to start a business than RIGHT NOW. Ask questions of and meet with attorneys, an accountant, business insurance agent and other experts at no additional charge. Draft a Press Release to get the word out. Learn about business insurance, patents and trademarks, hiring employees and other business essentials. Advertise and promote your concept for little to no money...Saving your hard earned cash. Generate new customers and new revenue in hours or days, not weeks or months! And much more…all in 1 action packed weekend! *All exercises are at your option. You can do all, some or none. 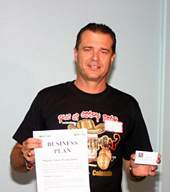 People Currently Employed - looking to start a side business or have a Plan B in place in case they need to make it their Plan A. Job Seekers - who are smart enough to realize jobs are scarce and starting some kind of business NOW gives them a chance to extend their runway while interviewing or hopefully replace the need for a job altogether. Stay At Home Parents - who are looking to supplement their household's income by turning their ideas into businesses quickly and inexpensively. Business Owners - who want to diversify their income streams and learn how to rapidly prototype and test most any idea within a couple of days for less than a few hundred dollars with the Startup Business Boot Camp "Rapid Startup Process".